"Ultralight" is starting to become an overused marketing word. However if any product can justify its use, it is the CAMP Windmit'n. The nylon shells weigh in at a scant 12 grams (0.4 ounces) per pair and pack down to the size of a tea bag. These are great mittens for slipping into your pack or a pocket and forgetting about until the wind picks up. 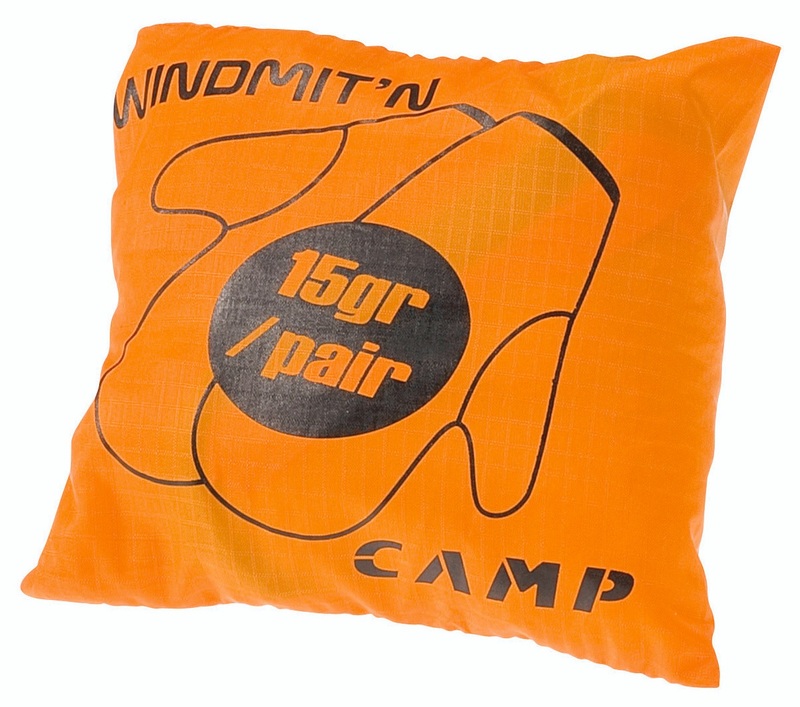 When it does, having some protection over your lightweight mountaineering or skimo racing gloves will be very welcome. Comes in two sizes (XS-M & L-XL) and one color (awesome orange). 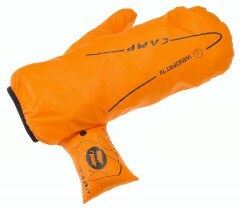 Designed to fit over thin gloves to add wind protection and warthm. Built-in stuff sack has these mittens taking up very minimal space in your kit. Elastic cuff is easy to work in a race, just throw on or rip off. Overall: Five Stars for a super-useful accessory if you usually get by with lightweight softshell gloves but occasionally need just a little bit more. Background on product familiarity: These always dangle away during my winter tours from a fakabiner on a pack strap and occasionally are deployed briefly. First, the first impressions out of the box: Wait, what are these, and how they can they pack up so incredibly small? The price:ounce ratio is also very high given their unexceptional fabric material, but the innovation is worth the price. Second impressions, in use: I run very hot, so I can get by with lightweight gloves for something like 99% of the time. For the remaining 1%, I’m always reluctant to go into my pack for bulky waterproof overgloves, especially given that stopping is just going to freeze me up even more. Instead, just deploy the separate wind mitten layer for that extra little bit of warmth and/or water resistance that is almost always all someone like me needs, as long as I’m still moving. Third impressions, for long-term durability: Will last okay if you use it only for skinning (as I have). But if you wear it while messing with buckles, skis, skins, etc., then it will shred fairly quickly (as a buddy has done, and as is obvious from even a cursory inspection of the material). I put these in my pack when I'm out in thin gloves and don't think I'll need anything more. Consequently I've only used them a few times over the last several years. When I do use them I'm incredibly glad to have them. They make a huge difference when the temperature dips and the wind starts to blow. Being a mitt, they obviously decrease dexterity and I'm not impressed with the water resistance. For the weight they are definitely worth buying though. I choose these over the ones that are built into the glove because I go through 2-3 sets of those thin gloves a year. This way I can buy new lightweight gloves as needed. I've had no durability issues with these mitts.